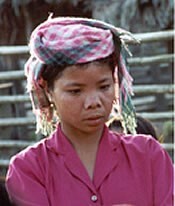 The Lamet are among the original inhabitants of the northwestern region of Laos. 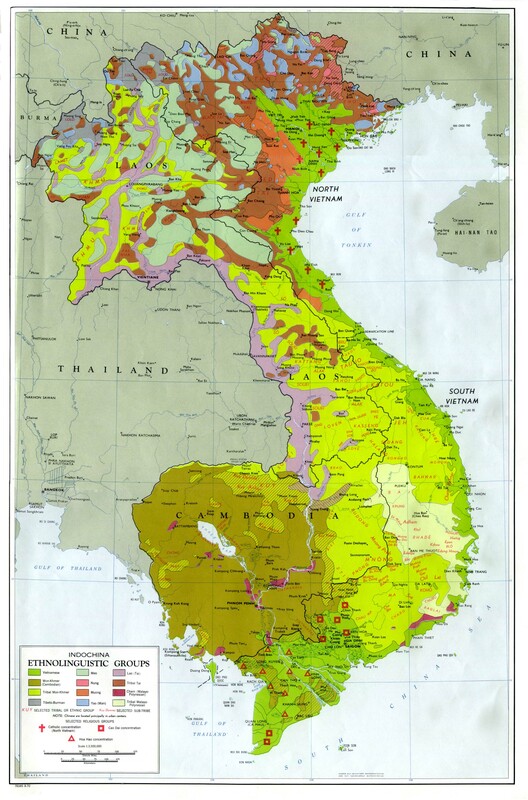 They are related to the Lao Thung (the "mountainside Laotians") who live west of the Annamite Chain. The Lao Thung make up approximately one-quarter of the total population of Laos; whereas, the Lamet number only a small fraction of that number. 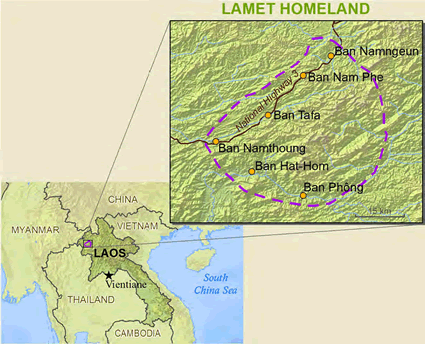 The Lamet live in villages that are scattered throughout the remote mountain regions of northwestern Laos. They sometimes go to the lowlands to find part-time wage-earning jobs so that they might purchase necessary items. Sadly, they are regarded as inferior by those who inhabit the lowlands, and are often referred to as kha (slaves). Some of the Lamet have accepted this status and use local myths to rationalize their position. The Lamet speak a Mon-Khmer language, also called Lamet, that is related to Palaung and Wa. Most adult males also speak Tai Yuan. Although Lamet villages are self-contained and self-sufficient, they are not isolated. There are very few political or social customs that extend beyond the village. Each household consists of about six to seven members. Family roles are clearly defined in the Lamet household; the male head of the household sits in village meetings and makes all decisions concerning the family. Lamet houses are built on wooden or bamboo piles and have indoor kitchens. The village is usually divided in half by the men's common house, or meeting place, in the middle of the village. After marriage, the newly married man lives with his wife's family and works for her father. The man then begins to make marriage payments. When all is paid, the couple either sets up their own household or moves in with the husband's father. Differences in wealth exist in most villages, and these differences affect the function of the village. The village headmen, or pho ban, serve as a link between the Lao officials and the villagers. Some of the headmen have secured their positions simply because they were wealthy. Among the Lamet, there is a clear line of distinction drawn between those who are wealthy and those who are not. To acquire the status of lem, or "one who is wealthy," a man must acquire wealth in the form of buffalo, chimes, and bronze drums, and be "acknowledged" by an established lem. The village lem are responsible for settling disputes and making important decisions. The Lamet engage in farming and hunting. The farmers primarily use the "slash and burn" method of agriculture. Rice is their staple crop. Trading is done with the Lao and Thai for items such as tools, clothes, and pottery. The Lamet are primarily animists (believe that non-living objects have spirits). They call these spirits phi. They believe that the phi dwell everywhere and cause both good and evil. The Lamet are also involved in ancestor worship (praying to the dead for help and guidance). Ancestor spirits are important to the Lamet because they supposedly look out for the well being of the household. The Lamet enjoy various religious celebrations and village ceremonies. These are usually conducted by the spirit practitioner, or xemia, who is responsible for making all the sacrifices to the village spirits. Communication with the Lamet is not easy because of the rough terrain and the isolation of the region in which they live. This region has also been the location of various civil and international wars. These wars have brought severe hardships to the Lamet. These precious people have a tremendous need for true, inner peace. A written language does not exist among the Lamet. Prayer is the key to seeing them reached with the Gospel. * Pray that God will send forth many laborers to work among the Lamet. * Pray that missions organizations and churches will accept the challenge of adopting and reaching the Lamet. * Pray that the few Lamet believers will rise to the challenge of taking the Gospel to their people. * Ask God to raise up prayer teams who will begin breaking up the spiritual soil of Laos through worship and intercession. * Ask the Lord to save key leaders among the Lamet who will boldly declare the Gospel. View Lamet in all countries.